Steven Vinson through four strong innings, striking out 9. It was one of those nights for the Ransom Everglades Raiders where everything went right. They produced 11 hits and earned a 12-0 win with outstanding pitching that sealed the deal. 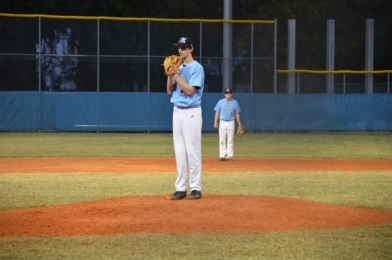 Vinson finished the day striking out nine in four innings, including striking out the side in the top half of the second. The Archbishop Curley Knights started strong with the lead, but struggled in producing any more runs the rest of the night thanks to stellar pitching by Raiders starter Steven Vinson. The Knights scored their only run of the game in the top of the first inning. Steven Garcia began things by drawing a walk that led David Diaz to lay down a bunt to move him over to second. Three hole hitter, Jordie Herrera, then stepped up and delivered. He sat back and drove one into right center for an RBI double, scoring Garcia. The Raiders stole the show after that, driving in a total of 12 runs to end the game early. The first runs for the Raiders came in the bottom of the first when Matthew Jackson hit one high to right field for a sacrifice fly to bring in Sam Bolduc. The next three runs of the inning came off the bats of Ryan Moralejo, Ilan Lindenfield and Vinson. Ransom stayed hot in the bottom of the second, scoring three. Bolduc drove in Alex Boehm, who had gotten on with a base hit and was then able to steal second base. The final two runs of the inning came off the bat of Ricky Suarez, who launched one into left, bringing in both Jackson and Bolduc. 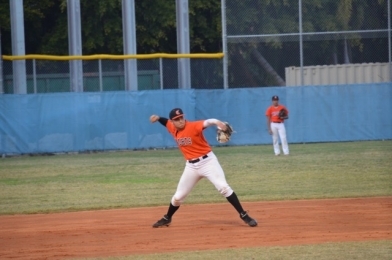 Knights shortstop David Diaz makes a play to record an out. The third and fourth innings were no different for Ransom, as the Raiders continued to widen their lead. The five runs between the two frames came off the bats of Bolduc, Suarez, Lindenfield, and finally Jackson in the fourth inning. The Knights showed some hope in the fifth, when they loaded the bases thank to two hit by pitches and an infield single by Steven Garcia. The Raiders, however, were able to get out of the jam to end the game. The Raiders hope to use this game as momentum as they are set to face district rival Marathon on Friday. The Knights hope to bounce back against Sagemont on Thursday in a big district game.